BEFORE: In memory of Tony Scott who died on Sunday, I’ll be watching his first big blockbuster, Top Gun. AFTER: I feel the need to learn how to fly. Like right now. And fly upside-down, in formation with the enemy ship. The only other Tony Scott film I’ve seen other than tonight’s Top Gun, was his remake of The Taking of Pelham 123 and I must say, I saw a lot of similarities. What Scott is most known for, and what I liked most about Top Gun, is a lot of motion in the frame and the editing. It’s not often that the camera is still in the film, and when it is, Scott has a good reason for doing so. This style helps tremendously for a film such as this where a lot of the action takes place with fighter pilots participating in dogfights. Aerial scenes lasted quite a while, some ten to twenty minutes. But because the camera was always moving and the editing kept the viewer’s perspective changing, the action did not drag on. The story is a classic underdog story of a guy fighting for the top position. 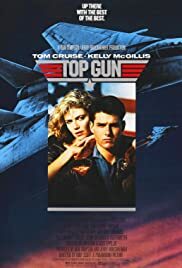 In this case, it is Maverick (Tom Cruise) trying to win the Top Gun title. I don’t have many problems with the story but I can’t say the same about the acting. Maybe its an 80s thing, but I just felt as if all the actors didn’t have any life. I just couldn’t connect with their characters in a way I could with, for example, another famous pilot, Luke Skywalker in Star Wars. Poor acting wasn’t enough to drag this film down though. Impressive enough is getting to use real, active duty fighter squadrons for the aerial scenes. Add to that editing that keeps the film flowing from scene to scene and you have some quality, and classic, entertainment.